Ever looked at your carpet and thought that maybe you should dump it and purchase another one or resort to hardwood flooring? No matter how clean you may try to be, you can’t avoid accidental spills or stains in your household. I often do a little painting as a sideline activity. However, for the past three years, not even a drop of stray paint has ever kissed my cream-yellow carpet. I could have flown my kite, but then my 18-month old tot disapproved it. My baby is very active, and curiosity might kill her one of these damn days. I found her innocently rubbing the almost empty acrylic paint tube in the carpet, trying to scribble down some illegible ABCs. Since I couldn’t wait any longer for her to grow to an age that she will have the ability to repay the damage, I just had to find out how to get acrylic paint out of carpet. I, therefore, spent many hours surfing the internet looking for the best way to get rid of the stubborn paint from my carpet. During my research, I found intriguing and educative information worth sharing and that’s why I decided to create this post. 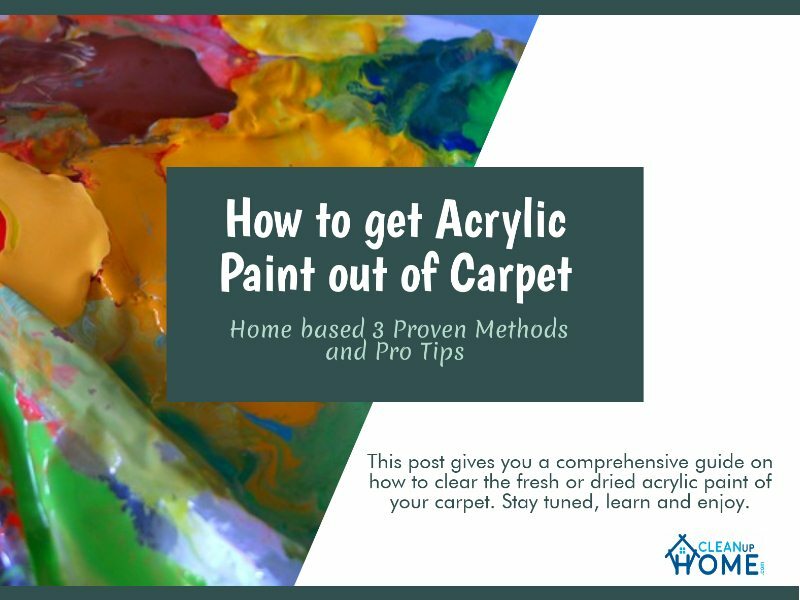 This post gives you a comprehensive guide on how to clear the fresh or dried acrylic paint of your carpet. Stay tuned, learn and enjoy. Removing paint stain from any surface depends on the state you’ve found it. If it is still wet, doing away with it is quite easy. The drier it becomes, the more stubborn and tighter it gets. Water or any other solvent is enough to lift a fresh acrylic paint. Professionals recommend that we deal with stains when they are still wet. However, this may not be practical because anything can accidentally happen when you’re not around. Here’s a list of the requirements you’ll need and the detailed procedure on. Using a soft brush, scrub the place to remove as much paint as you can. You may also use a putty knife or a citrus cleaner like Goo Gone, to scrap the stain. Blot the affected area using a clean cloth to pick up all the dried paint lifted through scrapping. The needle-nose pliers can also do the picking. Alternatively, use the vacuum attachment to lift the paint chunks from the carpet. Dip a dry cloth in the rubbing alcohol and blot the area. Soak and leave it untouched for 15 to 20 minutes to loosen the stain. Use a piece of clean cloth to dab the spot. A steam vacuum attachment is also essential at this point. Continue blotting the area until it is clear. Dip a cloth in glycerin and dab it in the acrylic paint stain. Repeat the blotting process until you can lift no more stain. Allow the glycerine to sit on the paint for a couple of hours. If you’re not contented with the results, you may continue blotting the spot with acetone. Afterward, you can perform steam vacuuming. Ensure the isopropyl alcohol is concentrated. The more concentrated it is, the better the results. Avoid scrubbing the carpet, but instead, embrace blotting. According to The Carpet and Rug Institute, scrubbing may end up damaging the fibers or transferring the stain to the adjacent area. Use a brush that’s gentle on the carpet fibers but tougher on stains. This tutorial is not limited to carpets but a general guideline on how to get acrylic paint out of clothes. For every cup of warm water, add a teaspoon of mild liquid detergent. Mix the solution in a bucket and store in a spray bottle for convenience. Dip a clean cloth on the solution and dab it on the stain. Use a brush, preferably a toothbrush, to gently rub on the area. Continue blotting the area to pick up the stain and use a steam vacuum to lift the solution. For every white vinegar part, mix with ten parts water. Dip the clean, dry cloth on the solution and dab the stain. Use another sponge to absorb the chemicals and dry the place. A similar process applies to the procedure on how to clean acrylic paint brushes. Dab the spot with cold water as a final step of cleaning. Patience and effort are essential when getting rid of the acrylic stain, regardless of whether it is permanent or not. Try out the vinegar on an inconspicuous area of the carpet to determine if it has any effect on the fabric or its dye. Pour a few drops of acetone on the acrylic paint stain using an eyedropper. Let it stay untouched for at least 8 minutes. You’ll observe that the stain seems to be worse than it was initially. However, don’t fret because that’s how acetone works when lifting even the best acrylic paint. Using a paper towel or dry material, blot the area to lift any visible paint. When the fabric is completely soiled, replace it with another clean piece. Repeat this procedure until the entire surface is bright. Sprinkle a few drops of spot solver on the affected area. In my case, Formula 409 stain remover worked for me. Using a toothbrush, agitate the place to develop some cleansing foam. Leave the foam to work on the stain for at least five minutes. Run the steam vacuum attachment on the spot to clean both the chemical and the stain. Repeat this procedure until there are no more blemishes. You can air-dry the entire mat or pass the damp area through the fans. Before applying any chemical cleaner to the acrylic stain, make sure to try it on a hidden area. This will help you determine if it reacts with the carpet’s color. This method is a common practice on how to clean acrylic paint on any surface, including porous and non-porous surfaces. When using acetone for lifting the acrylic paint stain, ensure to maintain proper ventilation and to wear protective equipment. This chemical emits strong fumes. The Canadian Centre for Occupational Health and Safety (CCOHS) has listed all the precautions one is to take when dealing with acetone. If you can, try to eradicate the acrylic paint stain when it is still fresh. From the New York Times archives, speed is essential when dealing with stubborn stains. At least, it prevents the formation of spots. As I come to the end of this tutorial, I’m hoping that you understand every bit of the details. Did you enjoy the techniques? If so, I’m glad to have brought an impact on someone. You can also take a step toward sharing it to help the next person who is still pondering on whether to discard the stained carpet or pay for the cleaning service. When my curious baby girl had started walking, I couldn’t contain her and her pet puppy in one room. Perhaps they also like art and painting because my living room carpet is a victim of their creativity. The best thing is that they can only access empty acrylic paint tubes, so, the mess is almost negligible. When I looked at my carpet and saw how it was full of stains, I knew there’s nothing else I could do except looking for the most affordable way of cleaning it. I was on a tight budget so, buying a new one or calling a professional cleaner wasn’t an option. After hours of research, I found educative information, which I had not known before. I decided to share it through a post, so I may help as many people as possible who might be suffering in a similar situation as I experienced. Why should you not share too? If you have any questions, compliments or you want to share some other hacks of removing acrylic paint stain, kindly drop them in the comment box below. Thanks a bunch for your time.